Vis is an island in the central Dalmatia with area of about 90 km2. Limestone crests hils are covered with macchia and fertile valleys, covered with red soils and interspersed with sand dunes, are cultivated with vines. The main settlements on the island are Vis and Komiza. Good quality accommodation in hotels or private apartments, unpolluted environment with the crystal clear sea and marine scenery as well as the local specialities – seafood from the cleanest part of the Adriatic, various sports and recreation opportunities, they all constitute the offer for your vaccation on Vis. Incredible history dating from Roman times can be found all arround the Vis island – roman city of Issa with square (agora – forum), the inscription by the hero Calius from the 4th century BC (the oldest verse found in Croatia), a bronze head of Aphrodite, fortreses, Franciscan monastery etc. make this place worth visiting. Fantastic nature with numerous bays and beaches that offers the peace and tranquility joined with traditional small home restaurants where you can eat in the surrounding of the home environment and try some local delicacies like lamb, weel or octopusy in the pot, fresh fish, sheep and goat cheese, local wine and herbal spirits etc. will make your hollidays on Vis memorable. Vis is was strategically significant in the Adriatic and was fought over in many naval battles. The Greeks, Romans, Byzantines, Slavs, Venetians, Austrians, French and British have all controlled Vis at different times. Major naval battles took place in 1811 when the British defeated the French and in 1866 when Austrian forces trounced Italy. During the Second Wolrd War the island was at different times under the control of Tito’s partisans and was the British Military Mission Headquarters. After the war Vis became a military base to which access was strictly controlled and it was only in summer 1998 that the island opened to foreign visitors. This protection from tourist development left the island unspoilt and the local population able to carry on their traditional way of life – fishing and farming. There are many vineyards and Vis has for centuries been famous for its wine. Opol is an outstandingly good light red wine, Visko Crno is a strong heavy red and Vugava a rather rich white wine. Visitors to the island will find the two small towns of Vis and Komiza full of history with wild mountain scenery and many donkey tracks that can be used for walking. Good restaurants offer locally caught fresh fish and lobsters served with the local wines. 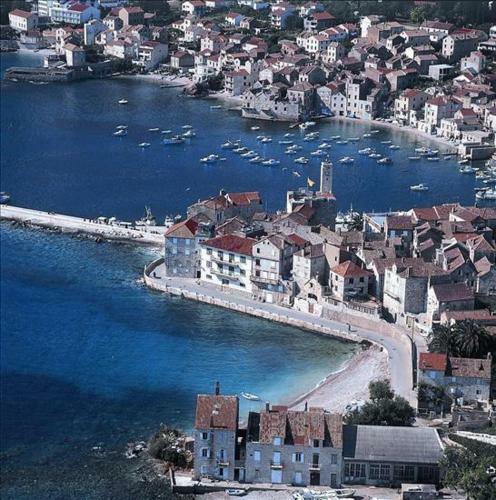 Hotels, Hostels, Apartments, Pensions, Private Accommodation at Island of Vis – book here! Worth visiting nearby is the island of Bisevo famous for its Blue Grotto locally called Modra Spilja aka Blue Cave. Also, the ruins of the town belted with walls (size about 10 ha) is situated on the southern slope of Gradine, on the western and eastern side are the graveyards Martvilo and Vlaška Njiva. On the Pirova Peninsula lie the remains of the Roman theatre (where the Franciscan Monastery was later erected). To the east side along the sea was the main town square (agora – forum), and the monumental thermals on the west side. Issa is the first city of antiquity on the Croatian coast built upon the regular urban matrix. Numerous valuable finds: inscription of the hero Calius from the 4th century (oldest inscription in this region), bronze head of the goddess Aphrodite or Artemis from the Praxitelean circle, collection of vases (southern Italian red figural, Gnathia, vases of local Issa production). Archeological collection ‘Issa’. The nearest airport is Split. Jadrolinija ferry lines has regular service to and from Split. 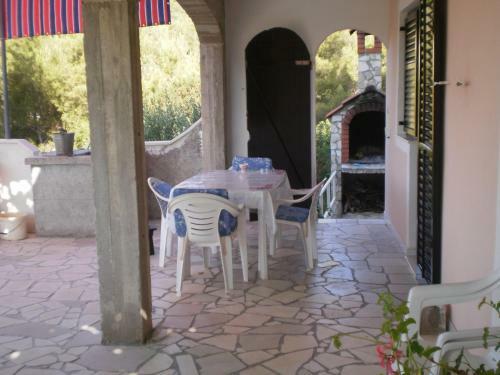 Vis Accommodation – b&b, rooms, hostels, cheap hotels in the Island of Vis – click to browse! Map of Vis Island – a practical map of Vis Island. Vis Panorama Photos – some good photos in a panoramic view from Vis Island.